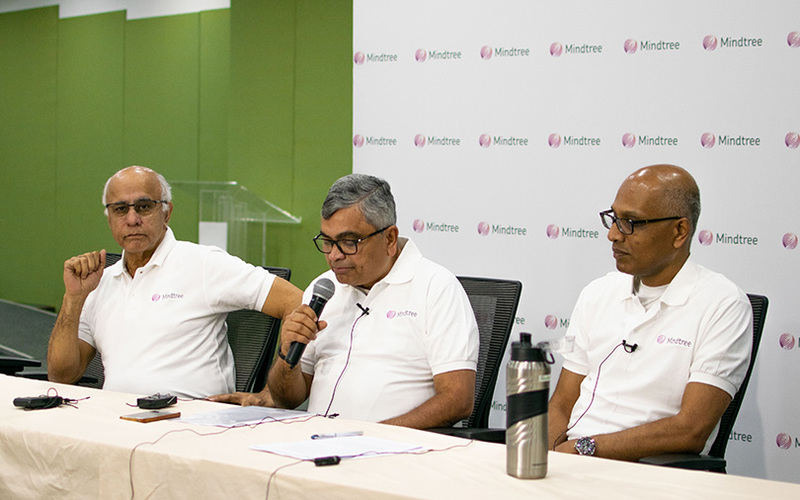 Mindtree promoters Subroto Bagchi, Krishnakumar Natarajan and Rostow Ravanan at a press conference in Bengaluru on Tuesday. The promoters of Mindtree on Tuesday flatly rejected conglomerate Larsen & Toubro’s hostile attempt to take over the listed software services company by spending around $1.6 billion. “We don’t see any strategic advantage in the transaction and strongly believe that the transaction will be value- destructive for all the stakeholders,” read a joint statement from Mindtree promoters Subroto Bagchi, Krishnakumar Natarajan (executive chairman), Rostow Ravanan (chief executive officer) and Parthasarathy NS (executive vice chairman and chief operating officer). The promoter group owns about 13.33% of Mindtree. Larsen & Toubro had late on Monday agreed to buy a fifth of Mindtree and initiated actions to take control of the company in a rare case of a hostile takeover bid in India. Claiming that the “unexplainable transaction” would bring disruption to the relationships built with clients and partners, the promoters said a takeover would impair Mindtree’s ability to differentiate itself in the market and continue to deliver client value. “We believe that culture needs to be carefully created and nurtured over time, and can’t be bought and sold like any asset,” the promoters stated. # You have chosen to mount the first-ever “hostile takeover” in the 50-year-old, unblemished IT industry. If you persist in what you are doing, you will forever be remembered for this. Is this how you want to set an example? # You are a company with a turnover of Rs 120,000 crore and 18 times the our size. Why can’t you build a great technology business with all your resources and capabilities without decimating another organisation? # Our customers choose us for our unique culture. They will stall all future business and even take their business elsewhere. In this process, you would have demolished the shareholder value of both companies. Is this the right thing to do? # This is a people business, Our people have signed up for a mission and not just a salary. Take their mission away and they will go. What would you be left with? # If companies like you behave with extreme hostility to first generation entrepreneurs, what messages are you giving to all startups in the country? According to L&T, Mindtree’s management had approached the engineering giant several years ago for an exit. But L&T was preoccupied at the time because of its focus on manufacturing and resolving its succession issues. However, Mindtree’s Natarajan offered a different version of events. “When L&T made a public announcement four years back to acquire us, it was we who rejected it. Our stand four years earlier and now is the same.” he said. On Monday, L&T said that it would buy the 20.32% stake that Cafe Coffee Day founder VG Siddhartha controls in Mindtree for Rs 3,269 crore ($476 million). India's biggest engineering company has also made an open offer to buy up to 31% more of Mindtree from public shareholders for Rs 5,030 crore and placed an order with its broker Axis Capital Ltd to buy up to 15% stake from the secondary market for Rs 2,434 crore. Overall, L&T may spend as much as Rs 10,733 crore ($1.56 billion) for the acquisition. Mindtree said its board will deliberate over the L&T proposal on Wednesday. “The 52-week high of the company was at Rs 1,183 (per share). And the deal (L&T's purchase of Siddhartha’s shares) was done at Rs 983. That itself reflects the value of the transaction,” said executive chairman Natarajan. For its part, L&T executives sought to calm investors, promising that they would run Mindtree separately from its technology services unit L&T Infotech Ltd.